The formula considered by top dermatologists consist of Hyaluronic Acid, Matrixyl 3000, Tripeptides, Palmitoyl and Seaweed Extracts. Exceptional ingredients skin tighteners known to increase elasticity. REJUVENATE AND RESTORE: Fight the signs of aging by reducing, bags, puffiness, circles and small wrinkles. RESEARCHED AND TESTED: All NeuCeutica products use the best ingredients available to achieve the desired effect. Guaranteed. Our LAB is the best in the US. FDA and cGMP certified. USAGE: Simply apply twice a day around the eyes on clean dry skin. Use morning and night before bed. GUARANTEED EFFICACY: Don't listen to miracle claims. You can expect as good results as the most expensive skin care products in the world. How to use: - Apply to clean dry skin twice a day. Once in the morning and once before bed. Ingredients: Deionized Water, Carrageenan (Chondus Crispus / Seaweed Extract), Matrixyl 3000 (Glycerin, Water, Butylene Glycol, Carbomer, Polysorbate 20, Palmitoyl Oligopeptide, Palmitoyl Tripeptide-7), Lycium Barbarum (GOJI), Coffea Arabica (COFFEE FRUIT BERRY), Euterpe Oleracea (ACAI), Morinda Citrifolia (NONI), Punica Granatum (POMEGRANATE), Camelia Sinensis (GREEN TEA), Garcinia Mangostana (MANGOSTEEN), Hyaluronic Acid, Acetyl Hexapeptide-8 Argireline), Polyacrylamide, C13-14 Isoparaffin, Laureth-7, Phenoxyethanol, Caprylyl Glycol, Potassium Sorbate, Hexylene Glycol. REDUCES PUFFINESS, CIRCLES, BAGS FINE WRINKLES: Neuceutica formulators have developed yet another outstanding anti-aging treatment for the reduction of crow's feet, fine lines, wrinkles, dark circles and other effects of aging and environmental damage that occur to the delicate skin around the eyes. USAGE: Dab around the eyes before bed at night and in the morning on clean, dry skin. 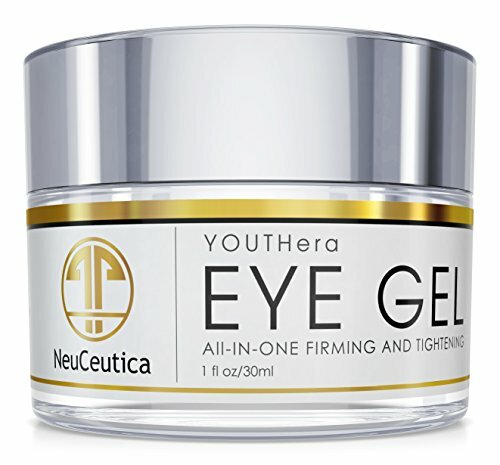 For loss of tone and resilience, this eye gel will deliver the results you seek and was designed to address all skin problems around the eyes. Not for dermatitis, acne blemish corrector or treatment, scar remover serum, concealer, firming mask, rapid blemish serum mask or dead sea scrub. THE NeuCeutica GUARANTEE: NeuCeutica Premier Beauty Products guarantees that all our ingredients are the best quality available with ZERO animal testing. We want you to be 100 PERCENT SATISFIED! All natural and organic compounds are used to build these blends and be the most effective products available. Contains no: caffeine, vitamin K, coffee bean extract, SPF, dead sea salts or bentonite clay, retinol, caffeine, jojoba, c serum, tea tree, rose hip or argan oil. If you have any questions about this product by NeuCeutica, contact us by completing and submitting the form below. If you are looking for a specif part number, please include it with your message. Jan Marini Skin Research Marini Luminate Eye Gel, 0.5 fl. oz. Sensibio Moisturizing Eye Contour Gel Cream for Puffiness and Wrinkles - 0.5 fl. oz.